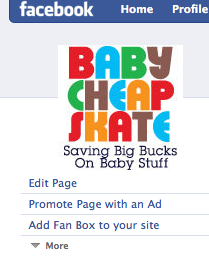 Facebook Fan Boxes offer another way to make your blog's Facebook fan page a more integrated part of your site. They allow you to show your fan page updates and a select number of follower thumbnails on your blog. Best of all, Facebook members who want to become a fan can do so with one click and without leaving your blog. Choose whether you want to display your stream and thumbnails of a few of your fans. Then just copy the script and add it to your sidebar. The widget is 300 px wide by default. Though there isn't a specific option for doing so, you can customize the width of the widget by changing the numbers in the script (minimum width is 200 px.). You can also change the number of "fan connections" (fan photos) shown by adjusting that number in the script. The "Advanced Options" you'll find below the script code takes you to the Fan Box developer page, where more techy folks can find a few more ways to customize. I have to admit that I feel a little weird putting my fans' clickable photos on my site without asking first, so for my Baby Cheapskate fan box, chose not to do so. I notice, too, that only the posts I contribute to the fan page show up in the widget. I wish that fan/reader comments were an optional part of the stream. Of course if all you're doing with your fan page (and I'm sure it isn't) is posting your feed, adding this widget to your site might be a bit redundant. What do you think? Would you feel comfortable displaying fans' profile thumbnails on your blog? Would this widget give your site some added value?